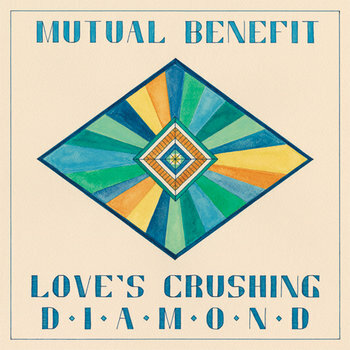 Love's Crushing Diamond is the proper debut album from Boston outfit Mutual Benefit and recalls earlier 2000s indie rock. Any of these tracks could easily fit on a high school mix CD buried between Devendra Banhart, Bright Eyes, Clap Your Hands Say Yeah and any other prominent freak-folk/lo-fi track from the not too distant past. Still, the simple pleasures and delicacy found here are not stale pieces left over from a time most didn't know they missed. If anything, Mutual Benefit seems to have added another chapter. It's more like a new friend that meshes so well with the ones you already have. It's immediately comfortable yet still offers something compelling with each listen. 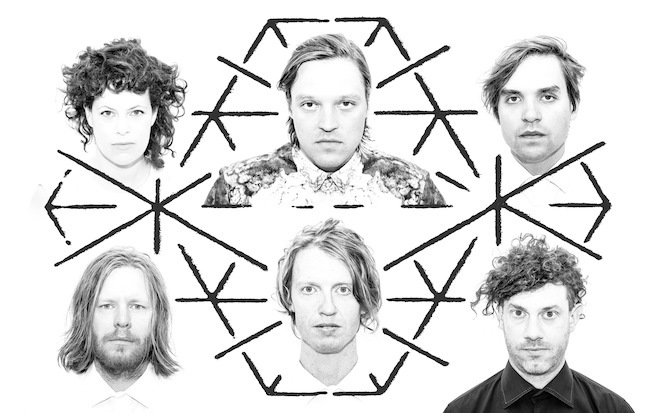 After dropping by Bushwick, Brooklyn for some secretive performances this past weekend as The Reflektors, Arcade Fire continue their mysteriously wonderful marketing campaign with the lyric video for "Afterlife". The track continues with the disco-tinged aspects that we heard on lead single "Reflektor" while still feeling like classic Arcade Fire. The album drops next week. Scream and shout! The Tension 2013 Tour crashed into Newark's Prudential Center for the second and final New York City area show this week and post-rock titans Godspeed You! Black Emperor handled the opening duties for the show. With their typical venues being small intimate (and non-corporate sponsored), this was a rather bizarre setting for the band. Hearing their delicate rumbles transform into monstrous storms in such a cavernous space felt extremely out of place. Nevertheless, the group was still in top form. Slowly assembling onstage in near darkness, grainy and out of focus film began to backlight the band as their tracks swelled to epic proportions. While Godspeed and Nine Inch Nails seem like such great tour mates, it was evident that those strictly in attendance for the headliner did not know what to make of them and chatted away through their all to brief set. As the lights darkened for NIN, all the chatter disappeared. When the curtain fell, the band was revealed in stark cubes of light as Trent led his impressive backing band into a full on rage, starting with the recent "Copy of A" and never turning back. The show catapulted to a start by banging out classics "1,000,000", "Terrible Lie" and "March of the Pigs" to which the audience erupted in chaos. Slowly the lights transformed and the show was taken to a new level. NIN may have been off the map for a few years, but this spectacle was something to behold and as near perfect as a show could be. Everything was on cue and seemed to go off without a hitch. Lights seemed to come from every part of the stage and just when it seemed to be peaking, another set of light encircled the band providing one of the most visually arresting performances I've ever witnessed. The set certainly favored Hesitation Marks, Trent's excellent come back record, but there were plenty of old favorites thrown in the mix as well. The main set ended with "The Hand That Feeds" and "Head Like a Hole" which were met with enormous joy. During the encore, Trent introduced a cover of Bowie's "I'm Afraid of Americans" to much amazement before closing out the night with a haunting rendition of "Hurt". Listening to an arena of people sing that song isn't something I'll soon forget. These days, playing an arena doesn't come with the same accolades as it did in the past, but Trent and company are here to raise the bar and take people back to a time when big budget rock music was something worth caring about and from which to be inspired. With the brakes slammed on side project How to Destroy Angels, it doesn't seem like NIN will be slipping back into darkness anytime soon, and with a stage show that impressive, perhaps only Radiohead (another band still praised for their 90s glory) can conquer an arena like Trent Reznor. Four Tet and Burial are no strangers to collaboration. On Sunday, Four Tet did an 8 hour takeover of Rinse FM and shared an old unreleased track which you can now check out below. While there's no word on any upcoming releases from dubstep mastermind Burial, Four Tet will release Beautiful Rewind on October 15.